A 42 minute documentary that I shot, along with cameraman Nick Porter and as the title suggests, in 24 hours. Two heavy cameras, battery problems and the logistical issues that come from staying awake for over 24 hours give this film a woozy, trippy feel. The film was screened at Raindance in 2004, and at Prends Ca Court, a Canadian film festival, in 2005. 24 Hours In London has also been accepted into the BFI Film Archive. Here’s the Raindance programme page, complete with mis-spelling of the film’s title and incorrect duration. Thanks, guys. I was also invited to write an article for Raindance’s own magazine on films and film-making earlier that year. There’s some useful insight into how the final doco was structured in this piece. 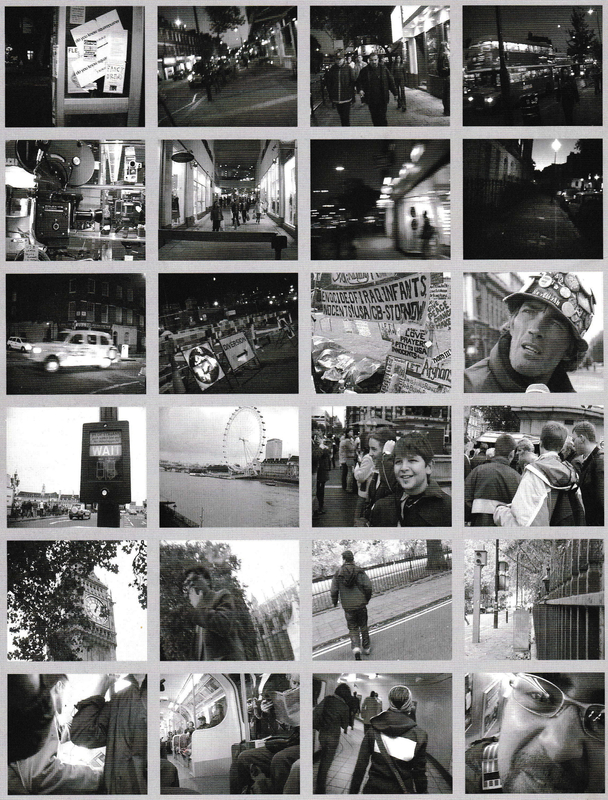 Finally, here’s a one-per-hour grid of stills from the film, which was the primary image I used to market 24 Hours In London. It had the advantage of being customisable as either landscape or portrait, and I could essentially put any picture in the grid more or less randomly.